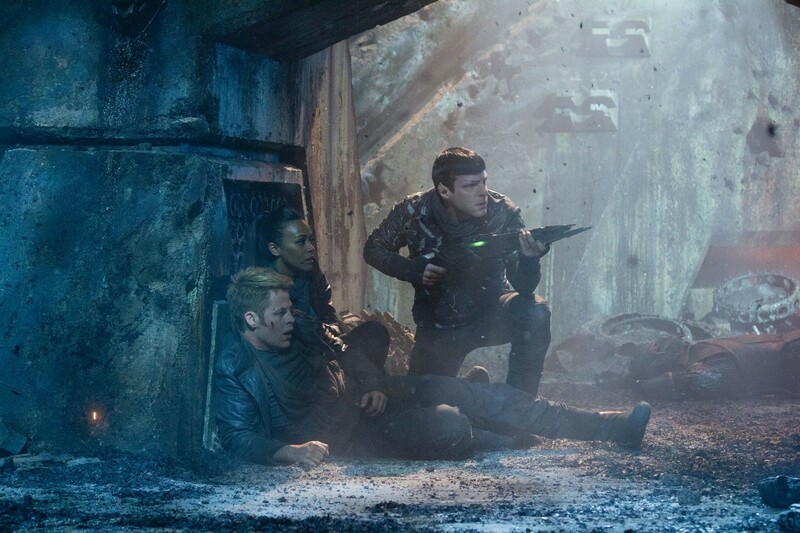 Like many high profile action blockbusters sequels of the last few years, Star Trek Into Darkness has updated its latest instalment to include a stereoscopic version. And like many of these sequels, success of the previous instalments is such that there is little need to display restraint. This means that while there was a recent period in 3D filmmaking when dogma (often led by James Cameron) decreed that limited depth budgets should be favoured and stereoscopic effects should be subtle and storytelling enhancing, the latest blockbusters have been gleefully throwing objects and action around the auditorium. Although Star Trek was converted into 3D during post-production it still uses the full range of stereoscopic depth in order to overwhelm the viewer with spectacular effects. After the Paramount intro, the film begins with embers hovering around the screen space. The justification is that Captain Kirk and Dr McCoy are running around a planet where a volcano has begun to erupt. However, the use of negative parallax to project the embers towards the audience is more apt as a sign that the film plans to bombard its viewers with sensory overload from the very beginning. In a nod towards the stereoscopic traditions that have been derided as gimmicky under the conservative digital stereoscopy regime, a number of the inhabitants pick up their spears and throw them towards the audience. During the rest of the sequence, as the characters flee the planet’s inhabitants and attempt to get themselves safely back onto their ship, numerous lightweight and fragmented objects such as white pollen seeds or splintering volcanic rocks fill the screen space between the audience and the characters. Throughout the rest of the film, scenes appear to be constructed specifically in order to allow this type of stereoscopic debris to drift, spin, twirl and dart towards viewers; either buildings and other urban spaces are destroyed so that exploding fragments erupt through the auditorium space or the characters find themselves in new terrain which is filled with windswept organic components. In these cases it is clear that the film wishes to signal its material but equally ephemeral presence as it develops its hyperactive and fast paced action. However, in a contrast to a trend in recent 3D films, the use of negative parallax and extensive depth planes does not increase throughout the film but, if anything, decreases. There has been a tendency for films (The Amazing Spider-Man (2012) Bait 3D (2012) Hansel and Gretel: Witch Hunters (2013) Jack the Giant Slayer (2013), Fright Night (2011)) to use overt negative parallax only in intense action sequences and to use it only minimally in the first sequence with gradual increases until the film’s climatic battle employs the greatest sense of stereoscopic effect. Star Trek begins with and repeats use of negative parallax during its first half but the effects becomes less noticeable and seem reduced in the second half. This may be because the audience becomes accustomed to the effects as the film continues but it remains intriguing that the use of sensory depth configurations is felt to decrease rather than increase. More interesting is the ubiquitous use of lens flare for which director J.J. Abrams has become famous. In 2D cinema, lens flare commonly reminds the viewer of the camera lens which forms a hard body between the viewer and the film’s action. Even though the use of digital enhancements in contemporary film means that lens flare is rarely a true indicator of a single camera’s observation point, it can work to draw attention to the physical presence of cinema’s optical illusion. When employed abundantly in Star Trek it takes on a new value that still highlights the film’s optical quality but does so with a new dynamic interplay. Rather than resting at zero parallax where the traditional screen plane operates, the lens flare appears to operate across various depth planes, often shifting from one to the other in quick succession due to the rapid speed of editing. It takes on a type of tactile quality in the way it encourages the viewer to think about the texture of the light interacting with the action and objects placed in depth. Because the lens flare is translucent it does not block the audience from seeing the action behind it but instead suggests multiple, touchable surfaces. While all of these aspects combine to create a rich and spectacular visual field they do not, unfortunately, hide the extent to which the characters and their interactions are less engaging. The film is a fun romp through a space adventure, and Benedict Cumberbatch acting as Kahn steals the show with an excellent performance, but the film does not have the same character development and easy wit of the previous instalment. This is a shame as there are some scenes when stereoscopic depth planes are utilised in a way that has the potential for engaged interaction rather than just spectacular display. At one point Kirk is called to speak to Admiral Pike in order to defend his actions on the volcanic planet at the beginning of the film. During their argument there are carefully constructed shot/reverse-shots in close-up over each shoulder. The intimate details of each character’s face are clearly defined and given greater weight by the stereoscopic contours. Although the out-of-focus shoulders in each shot prevent us from direct alignment with the characters’ view point, we do seem to be brought nearer to each character. There is an experiential presence to the characters’ faces as they bulge slightly towards us. Had the film introduced a greater sense of gravitas throughout, scenes such as these would have been able to prompt heightened involvement in its characters. As it stands, the film is enjoyable but somewhat flimsy in its development. On a final note, I won’t say too much about the unnecessary shot of Alice Eve in her underwear as I have talked quite a lot about the depiction of women in recent 3D film. I will only reiterate that character development was somewhat lacking in the film.